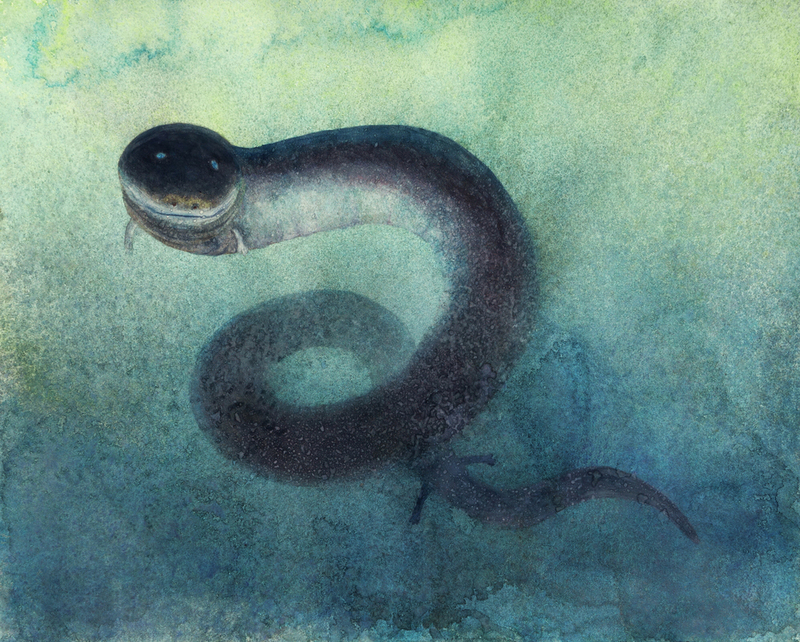 Recently, I was hired to do another commissioned painting of an amphiuma - an aquatic salamander with vestigial legs that looks like an otherworldly sea serpent or eel. My patron saw my first commissioned amphiuma painting done for Dr. John Pojman (it hangs in his office above his amphiuma Chrissy's aquarium) and wanted an original piece for herself. The previously commissioned portrait of John's amphiuma Chrissy. Unfortunately, after mailing the new piece off to my customer and tracking it through delivery, there was radio silence. I worried that she didn't like the piece but also considered that she may have just been waiting to open it on a specific date (an upcoming birthday, for instance) so I made a mental note to send her an email in a week or two to check in. Before I could, she emailed me, and it transpired that the package was, in fact, not delivered (or possibly, not delivered properly and stolen off communal property). Queue multiple weeks of back-and-forth with UPS, but finally the insurance paid out such that I had been paid to make the commission and my client received a refund on never having received the commission, so we were both made mostly whole again. Even though it's possible it's now lurking in a box in a UPS subbasement or was pawned for the value of the frame, I like to imagine the painting is hanging in a place of pride over a drug lord's couch somewhere. Since I do have the digital image, though, I can at least run off reproductions, so it's not completely lost to the world.